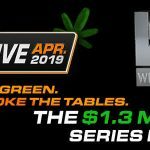 The Winning Poker Network is adding $40,000 per week to its Sit N Crush leaderboard competition during May, plus bumping up the leaderboard points players can earn by playing “On Demand” games. The format of On Demand games has also been changed to make them more appealing to play in. The Winning Poker Network´s Sit N Crush progressive leaderboard competition is a great way of supplementing your bankroll if you have a preference of Sit & Go, Jackpot Poker and On Demand games. Each week, the Network pays thousands of dollars in cash prizes to dozens of players, many of whom also win seats in the Network´s Live Cage qualification tournaments. For the next four weeks, the Network is increasing the cash prize pool fund by $40,000 per week and distributing it in chunks of $1,000 and $500 to players in places 1-60 on the leaderboard. The site is also incentivizing players to register early for its On Demand games by doubling the number of points awarded for preregistration, and has changed the format of the games to make them more appealing. Every time you enter a Sit & Go, Jackpot Poker or On Demand game at Americas Cardroom or Black Chip Poker, you are awarded Sit N Crush points according to the buy-in of the game and the fee paid to play in it. A quarter of the fee paid goes towards increasing the value of the progressive prize pool, of which 75% is added to the cash prize pool and 25% added to the tournament entries pool. The outcome of the game does not affect the points you are awarded; so, whether you win or lose, every game you enter (except heads-up games) will count towards your leaderboard position and increase your chances of winning a prize. Normally you can better increase your chances of winning a prize by playing On Demand games, as these award double points. However, during the Sit N Crush promotion, the Network is awarding double-double points for preregistration in On Demand games. On Demand games are similar to regular Sit & Go games inasmuch as they start when a predetermined number of players have registered. However, once each game starts there is a period of late registration during which other players can join in – adding to the prize pool and the number of players paid. Typically the number of entries in an On Demand game will double from the time the game starts until the end of late registration. If you register for a regular 9-Max Sit & Go game with a buy-in of $20 + $2, you will receive 2.5 Sit N Crush leaderboard points. If you register for an On Demand game with a buy-in of $20 + $2 once it has started, you will receive 5 Sit N Crush leaderboard points. 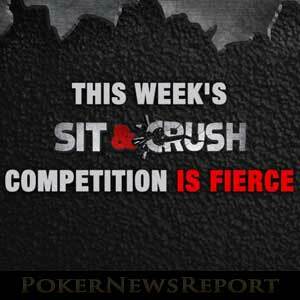 If you register for an On Demand game with a buy-in of $20 + $2 before it starts, you will receive 10 Sit N Crush leaderboard points. On Demand games are located in both the Sit & Go and Tourney lobbies with buy-ins starting at $0.50 + $0.05, going up to $100 + $9. As well as a full range of buy-ins for NL Texas Hold´em On Demand games, you can also play PL Omaha Hi/Lo On Demand games that have buy-ins of $7.00 + $0.70 and $15.00 + $1.50. The PL Omaha Hi/Lo games tend to be more popular in the evenings when the Network´s Omaha community sign-in to play. Prior to the start of this promotion, On Demand games had a varying number of entries required before they could get underway. Often you might find a low buy-in game only requiring six players to register before it would start, while a higher buy-in game may require twelve or eighteen players to start. Now most of the entry requirements have been standardized and the games require twenty players before each one begins. The exception being On Demand games with a buy-in of $0.50 + $0.05. Other changes include an increase in the starting stack to 30,000 chips, an increase in the blinds and antes at the earlier levels (now starting at 250/500 with a fifty chip ante), a standardization of level lengths (now all five minutes) and of late registration periods (fifteen minutes/three levels). This means that players involved in the game from the first hand will have the equivalent of 60 BBs, while those registering at the last minute will start Level 4 with 15 BBs. The combination of quadruple Sit N Crush points and the changes to the format of On Demand games has had the desired effect and driven players to the On Demand games. Games are running around the clock at most buy-in levels and the Sit N Crush leaderboard competition is heading towards an exciting climax on Friday. If you want to be part of the action, it is not too late to get involved. The promotion only started this week and runs until Friday 1st June.